Good day OCF community. 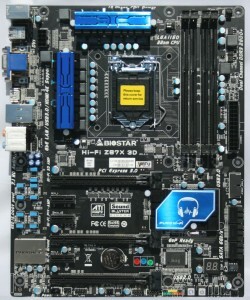 Today I am excited to bring to you another motherboard in the Z87 line! 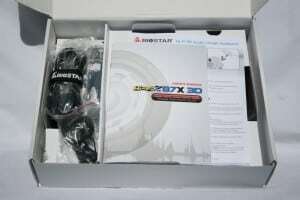 This time, it isn’t from the ‘big three’, but from BIOSTAR. 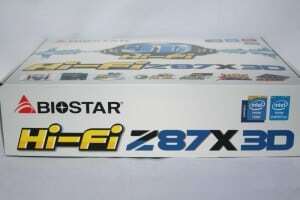 They were kind enough to send us their Hi-Fi Z87X 3D motherboard for review. 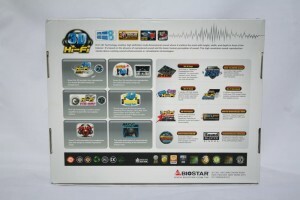 BIOSTAR has seemed to put a focus on the audio side of things with this board. 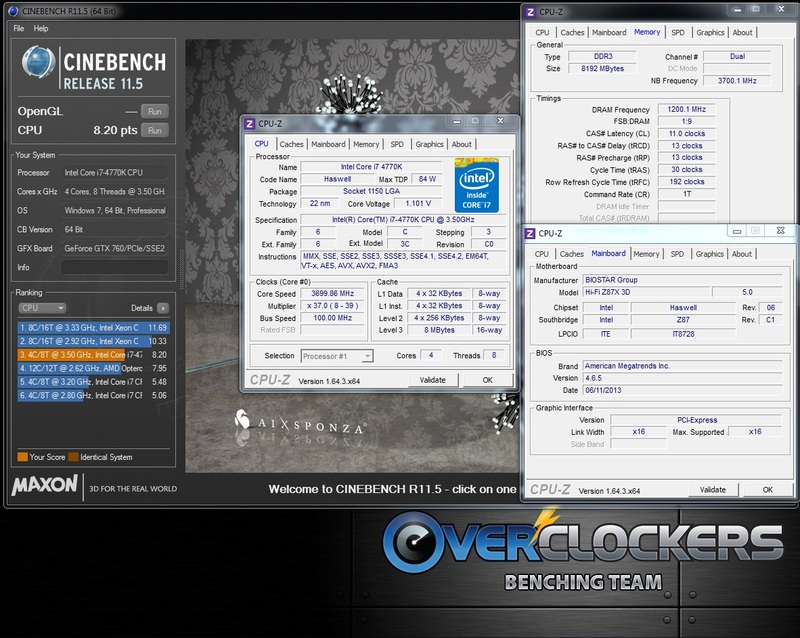 So we will see what hardware changes they made to help that side out as well as test the board in the ‘Overclockers.com’ way and see what we have in the end. 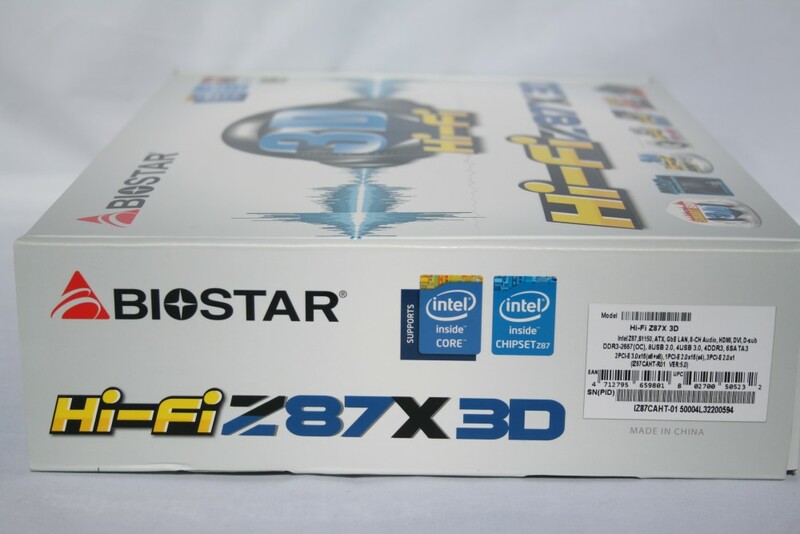 Below is a look at some of the high-level specifications and features of the BIOSTAR Hi-Fi Z87X 3D Motherboard. 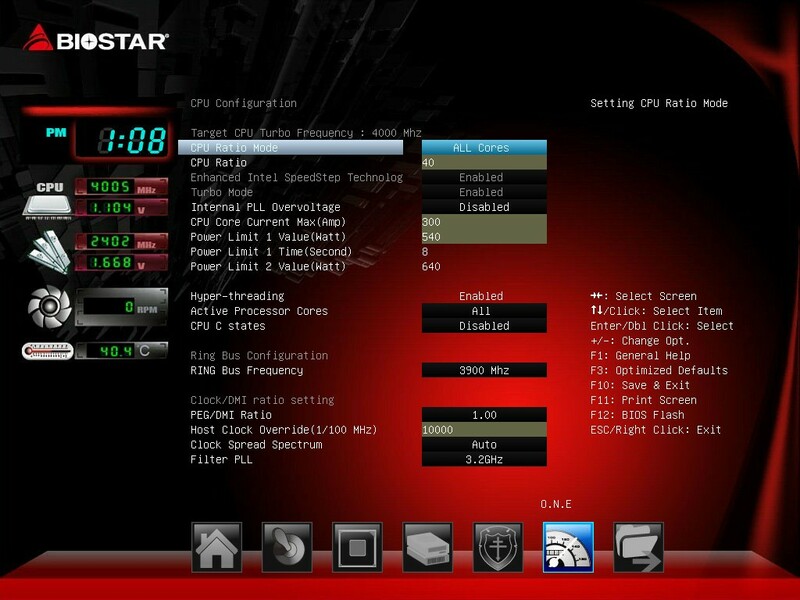 This board supports memory up to 32 GB of 2800 MHz(OC), supports Crossfire X (CFx moving forward) configuration (no SLI! 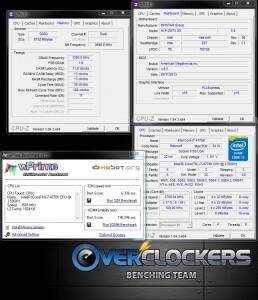 ), six SATA3 ports, and a total of four USB3 ports (two rear, two front via header). 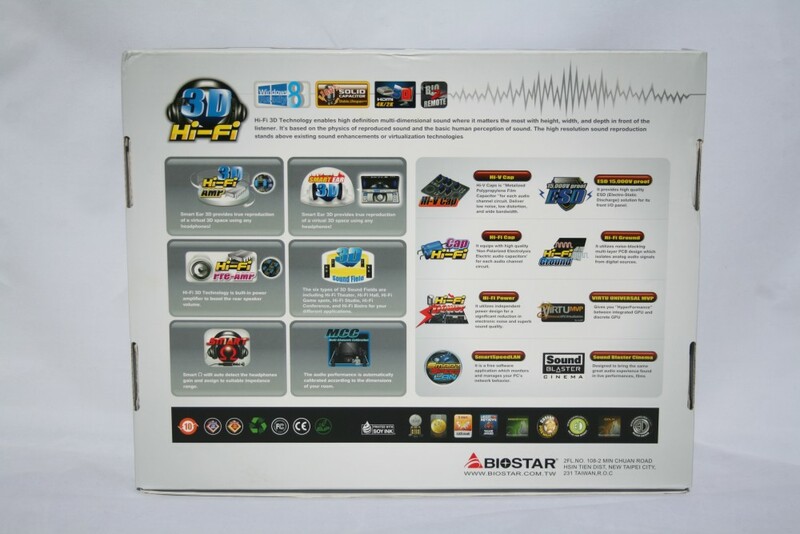 You can see in the features section BIOSTAR has really made a point to market the audio section of this board, so below this raw data, you will see a bit more information on what those features are. 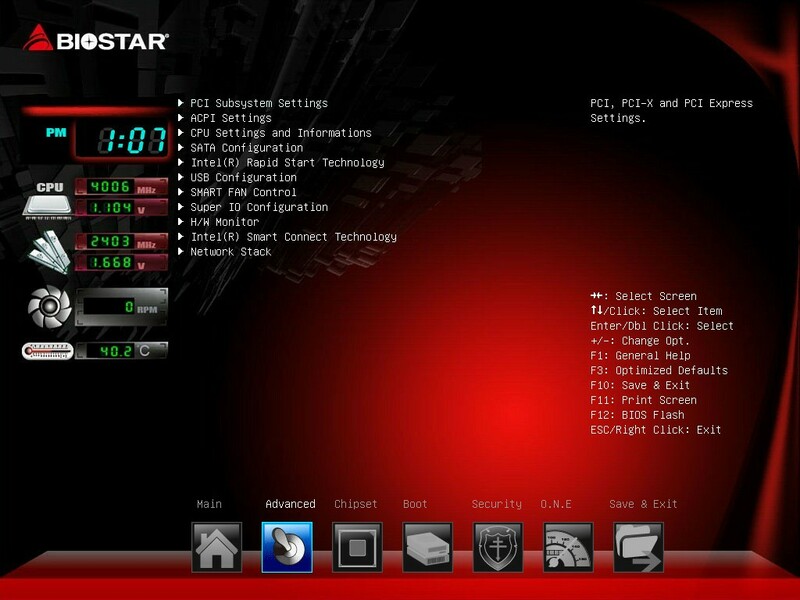 Below is a list of Features sourced from the BIOSTAR website for this board. Hi-Fi 3D Technology is built-in power amplifier to boost the speaker volume. It will increase double volume level with high-quality HD audio output. Hi-Fi 3D Technology not only improves on the headphone but also enhances your speakers’ sound volume. Hi-V Caps is “Metalized Polypropylene Film Capacitor” for each audio channel circuit. The customized audio capacitors deliver low noise, low distortion and wide bandwidth to achieve the highest sound resolution and sound expansion. Smart Ear 3D provides true reproduction of virtual 3D space using any headphones! 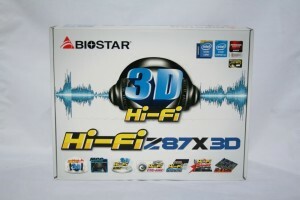 It delivers the true 3D sounds for music, movies and also games. It’s fantastically, especially if you’ve never experienced this kind of acoustic phenomenon before. As you can see from above and from the webpage itself, BIOSTAR has chosen to focus on the hardware and software for the audio side of things. 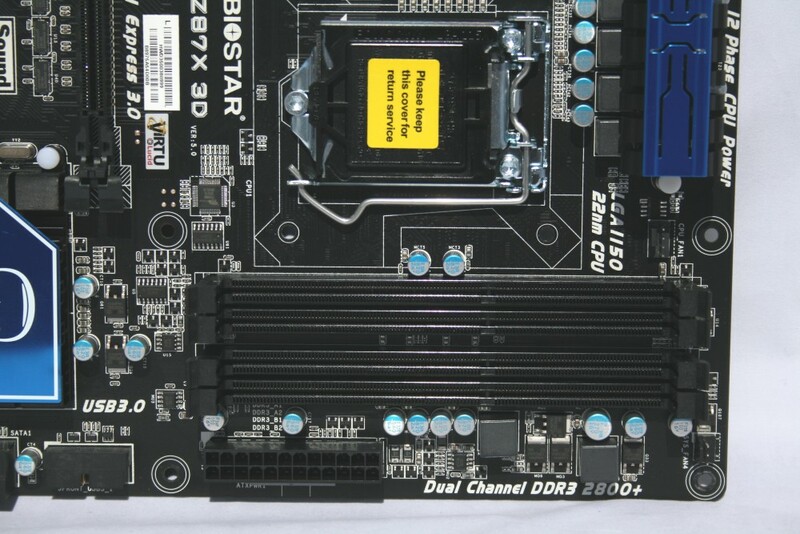 Like others, BIOSTAR has also separated its audio section from the other parts of the board to minimize any EMI which in turn helps out S/N ratio (110db+ on this board) and overall audio quality. They use Hi-V caps for each channel to minimize noise and distortion to help bring you the best quality sound from the Realtek ALC898 chip. The sound area can drive a pair of headphones with its built in amplifier, or your cans can use its own as this has its own pre-amp as well. Along those lines, BIOSTAR uses their “Smart Ear 3D” technology to give a “…true reproduction of virtual 3D space using any headphones! It delivers the true 3D sounds for music, movies and also games.” This comes across as a very well rounded audio solution taking in to account both speakers and amplified/un-amplified headphones. 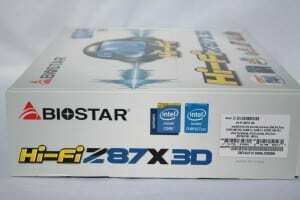 Ok gentlemen and others, we are first going to look at the retail packaging and some of the goodies/accessories the BIOSTAR Hi-Fi Z87X 3D ships with. 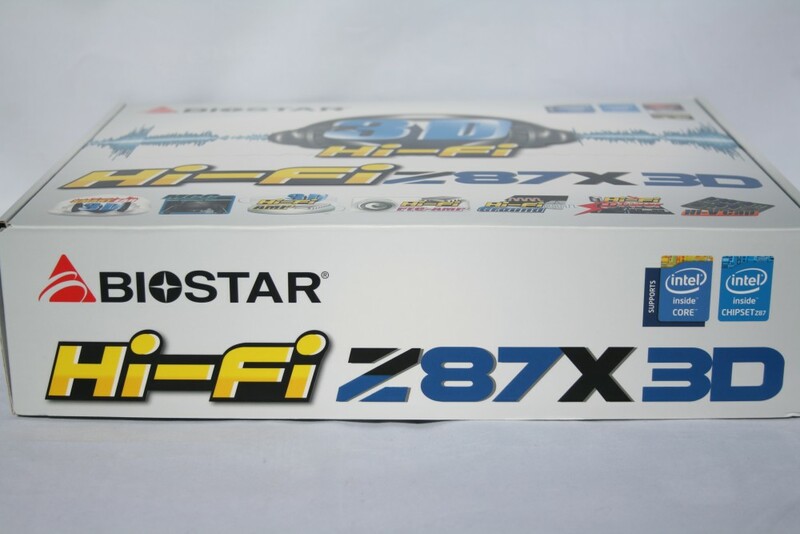 As you can see, the retail package is a base white color with large 3D Hi-Fi ‘signage’ staring right at you. On the bottom are small pictures advertising some of the audio features and other things we mentioned above. Clearly they want to advertise the audio side of this board! Flipping it over to the back side, we see more marketing of what makes this board, well, this board! Towards the bottom are some awards and accolades from other review sites. When opening up the box, we are greeted with the accessories resting on a cardboard separator above the motherboard. Moving that stuff out of the way yields the motherboard in an anti-static bag sitting on some thin padding. I don’t think we need to go over the bottom or side of the box do we? The accessory stack includes what one would need to get up and running… and that is about it. From left to right we can see SATA cables, the I/O plate, as well as the manual and the quick start guide. What is not pictured is the driver disk that is sitting in the optical drive at the time we took these photos (oops!). Again, not loaded with extras, but enough to get you up and running on day1 as is expected with a mid-range motherboard. The next thing we get to take a look at will be the actual board itself. 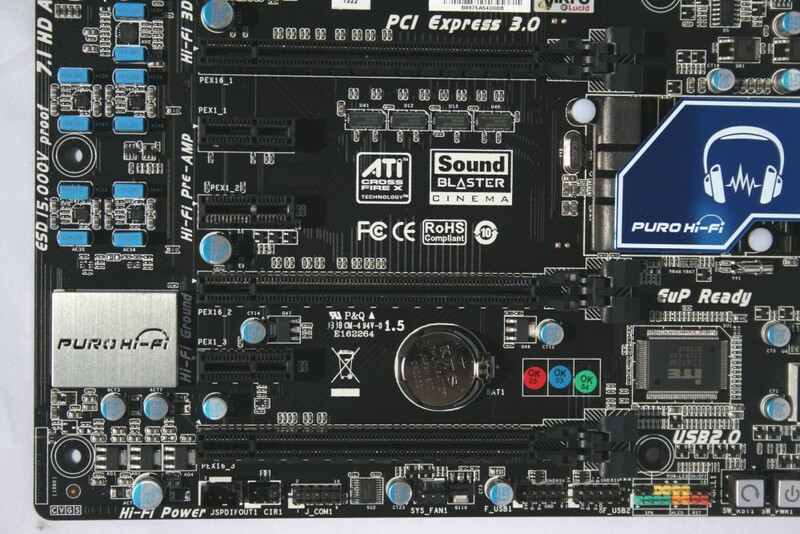 We can see this ATX form factor board is a nice black PCB while using blue heatsink ‘flare’ on the power delivery area and PCH, which jives quite nice with the audio section’s Hi-V caps. 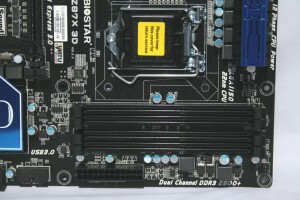 The four DIMM slots are also matching the PCB in black, as well as the PCIe slots. If you look closely around the board we can see a total of, from my count, five fan headers total. Other things to note are the separated from the other parts of the board audio section and its little cage over the Realtek ALC898 audio codec. The last thing is the debug LED and power/reset buttons making this a plausible solution for case less, or I suppose more specifically running without power/reset buttons on the case, or benching station, or perhaps even a box top! When I flip the board over, we do not see terribly much back there to be honest. 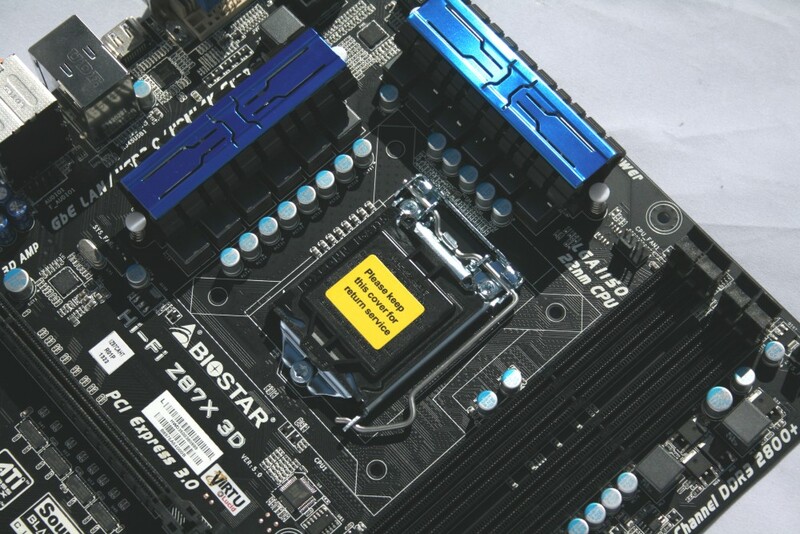 That said one thing I do see that I always get nervous about are pushpin mounts for these heatsinks. Let’s hope they are making good contact when we break it down a bit later. Overall I like the appearance of the board. 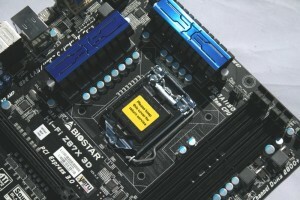 Moving in to specific areas of the board, I first like to take a look at the CPU socket area. I can count no less, and no more than, 12 phases on the motherboard for CPU power. Looks to be a 12+2 setup with the other two, picture in the lower right hand corner. You can see here a bit more clearly the push pin mounts for the heatsinks. 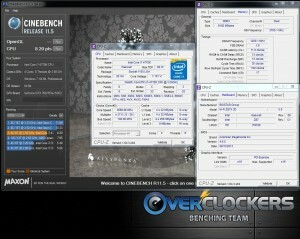 Partly pictured is the 8 pin power for the CPU as well as the CPU fan header to the right of the top heatsink. 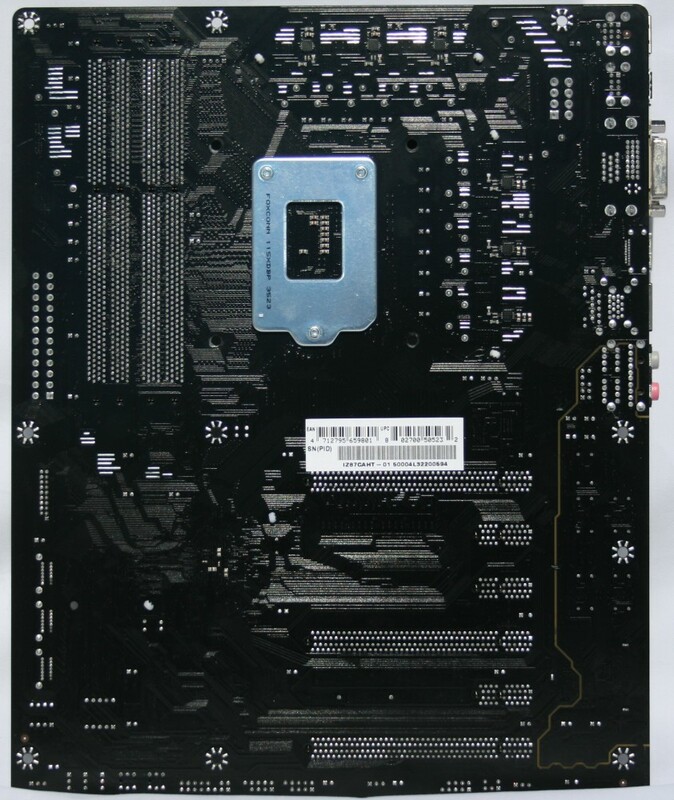 The next area we will look at is toward the middle and bottom of the board and contains the PCIe slots. It’s setup in a x16/x1/x1/x16/x1/x16 physical configuration. 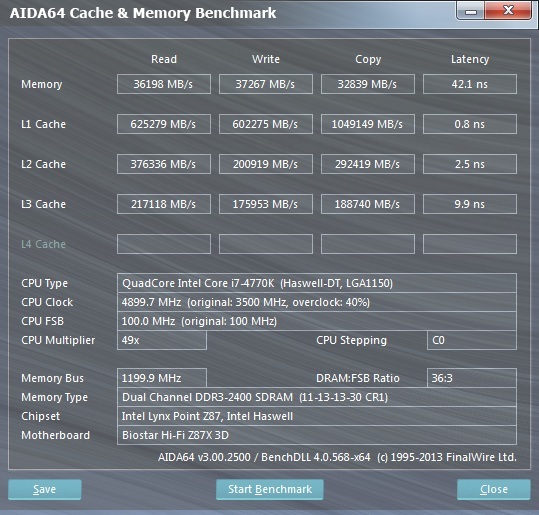 The board is only CrossfireX certified and the lanes break down to x8/x8 when running two AMD cards. No fancy, and cost increasing, PLX chip here for more PCIe lanes, but most know that any losses from an x8/x8 setup are negligible anyway. Last up for this picture, towards the bottom right, to the right of the bottom PCIe slot, there is an mSATA port so one can utilize the Intel RST and its cache features with a mechanical HDD or on its own. Sliding up and to the right of the socket is the DIMM area. Of course we will find our four slots which run in dual channel mode when populated properly. 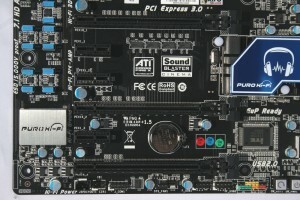 Outside of a system fan header, we can see its two power phases, the 24pin ATX as well as a front panel USB3 connector on the bottom left of this image. The third image is a just top down shot of the 8 pin CPU power mainly. In it you can see the chip that controls all that power just below it. The last picture in this grouping is of the audio section. A couple of board makers recently have been separating the audio section from the other parts of the board in order to improve sound quality by lessening the interference that other local parts may provide. Under the hood of that Faraday cage, which glows red when the board is powered, is the heart of the Hi-Fi audio on the Z8x 3D, the Realtek ALC898 chip. That chip is good for eight channel surround and over 110+db S/N ratio. Now, I don’t have the tools to measure such claims, so we will take their word for it. Also pictured hardware wise are the blue Hi-V caps that are said to, “deliver low noise, low distortion and wide bandwidth to achieve the highest sound resolution and sound expansion.” You can also use this audio section with a quality set of cans as there is a pre-amp and amplifier for up to 100db loads and 600Ohm impedance. Now we can check all the inputs and outputs. First we start with the rear I/O. 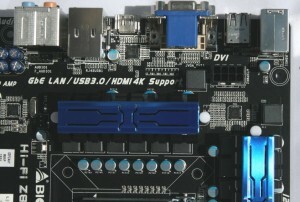 From left to right we see a PS/2 port above two USB2 ports. To the right of those are two more USB2 ports, then the video outputs (VGA, DVI, and HDMI supporting up to 4K resolutions). To the right of that is the GBe Ethernet port on top of two USB3 ports, and finally the audio. What I do not see that, to me, sticks out is a lack of an optical output from the audio section. With all the audio goodies this board has to offer, I would have liked to have seen such an output in case you wanted to send that to you Home Theater setup. Next up are the six SATA3 ports. By now we know the Lynx Point (x81,85,87) chipset brought us six native SATA3 ports. But that is all you get. There are no 3rd party chips on this board to add more SATA ports. This should only be a concern if you use more than that. 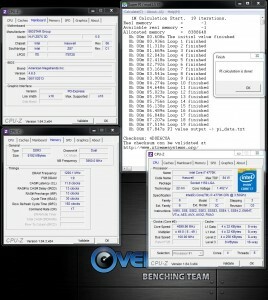 Otherwise, nice to see Lynx Point bring six native SATA3 ports to these Intel motherboards. The bottom I/O area has your typical headers for (again, left to right), SPDIF out, COM1, a Sys Fan header, two USB2 headers, the front panel LED and switch headers, and finally some jumpers with one of them to reset the CMOS and another Sys Fan header. There is nothing that stands out as epic on the board, but at this level, I can’t say I am expecting anything to be either. There are enough SATA3 ports, enough fan headers, and enough USB3 connectivity for most. But nothing is spilling over as excessive. I have not seen a BIOSTAR UEFI before, so this is my first time in getting some exposure to them. 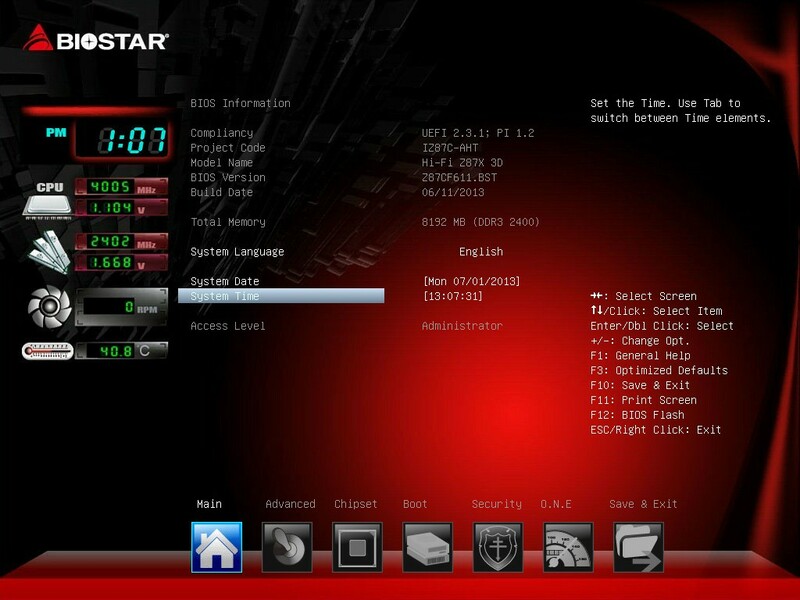 Presented below is what you will be greeted with upon entering the Hi-Fi Z87X 3D UEFI BIOS. 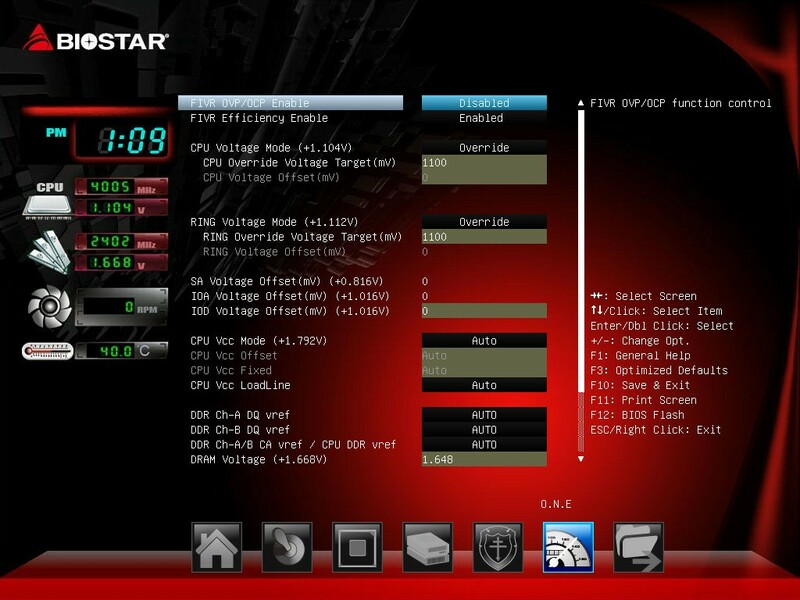 We see some high-level information on the screen such as the time, CPU speed, voltage, and temperature, memory speed and voltage as well as the fan speed plugged in to the CPU fan header. 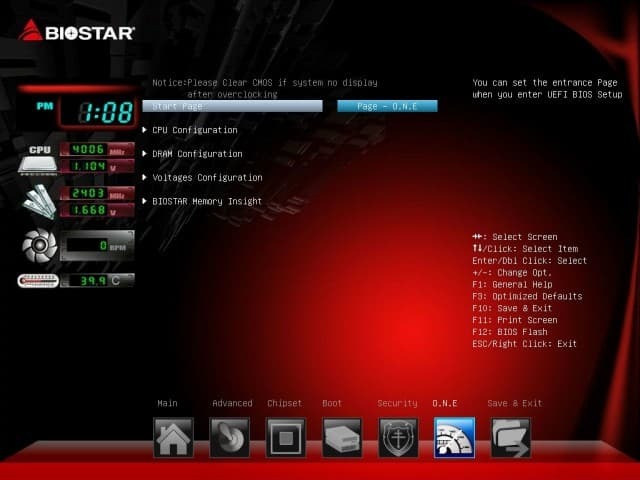 Other things like BIOS version, model, and name are in there as well. 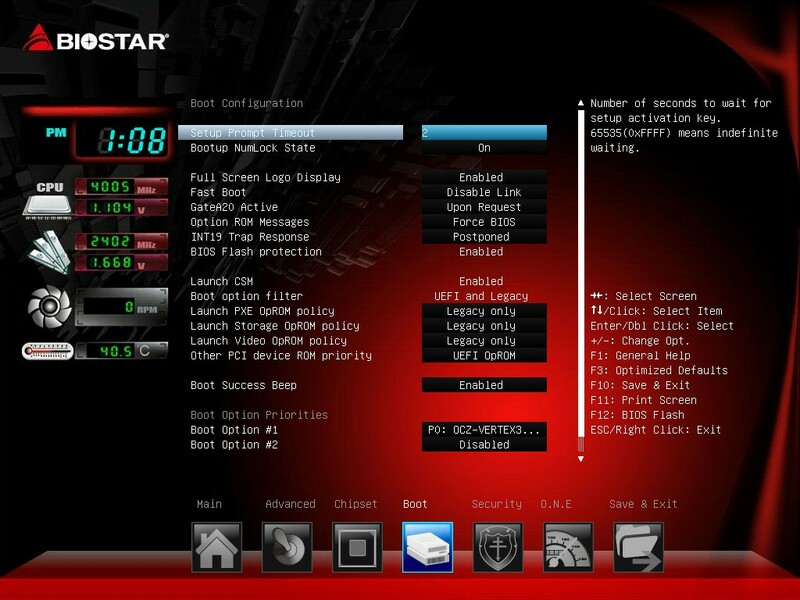 The other BIOS options are listed as icons on the bottom of the screen. The first selection at the bottom is Advanced. 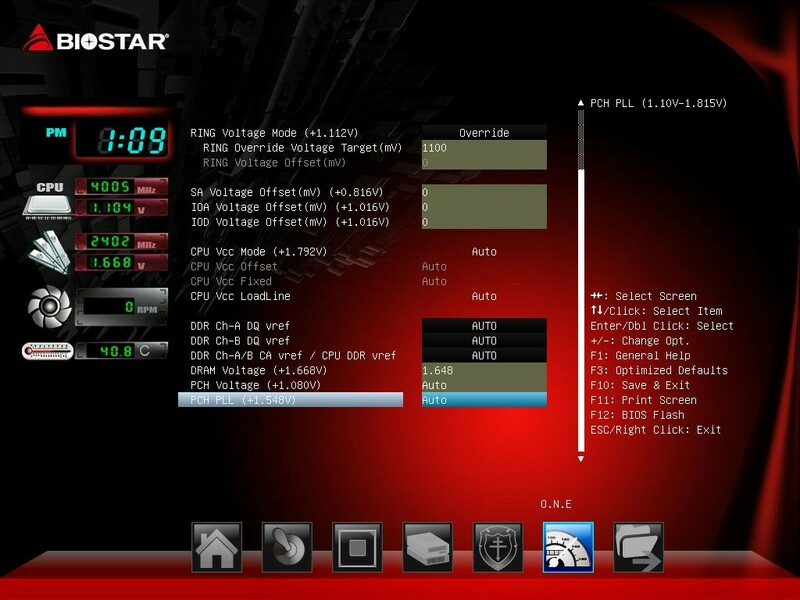 Under this option is where you will find things like SATA configuration, Intel RST settings, USB configuration, fan control, and hardware monitor among other things. Moving over to the chipset, there is PCH-IO configuration and System Agent (SA) configuration. The boot section is just that. 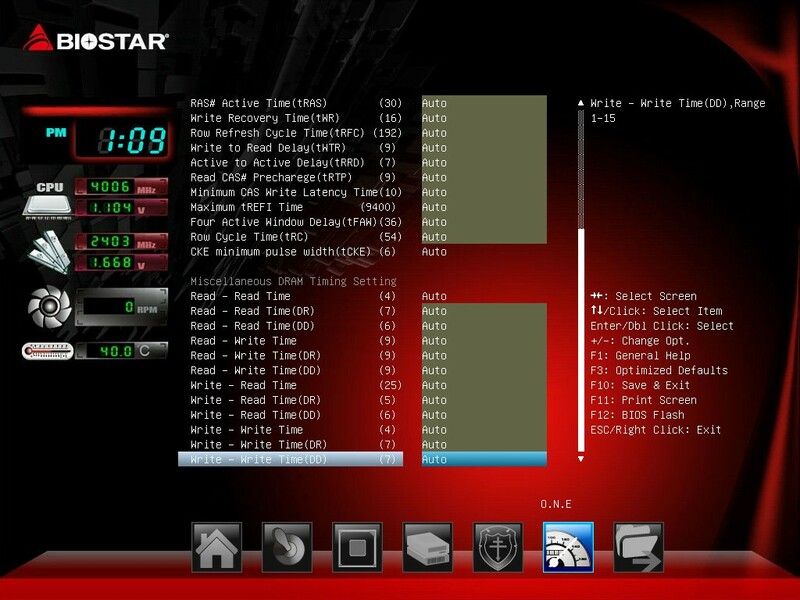 Here is where you get to adjust your boot time settings. Simple and to the point, just as I like this section really. This simple implementation I like better than MSI’s seeming ‘throw all possible boot devices on one screen’ type situation. 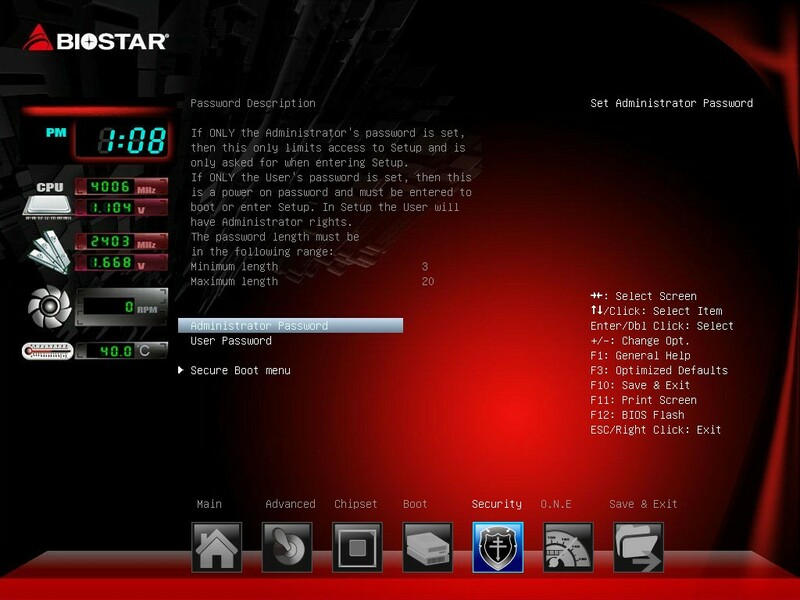 Last up with this set of pictures is Security where one can set passwords and, you guessed it, secure the system from the BIOS. 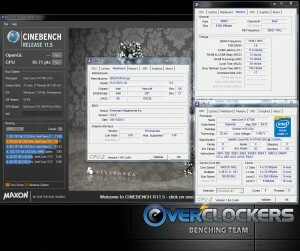 In the overclocking section (O.N.E), you are presented with a few options. First is the CPU configuration, next DRAM configuration, Voltages configuration, and last, BIOSTAR Memory Insight. One neat feature about this section is that you can set which screen you would like your BIOS to start in upon arrival. In this case, I have it set to the O.N.E page. Again, a pretty cool feature that can save a couple keystrokes, no doubt. 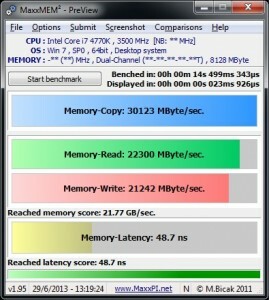 After hitting enter on the CPU configuration you will be presented with the screenshot below. 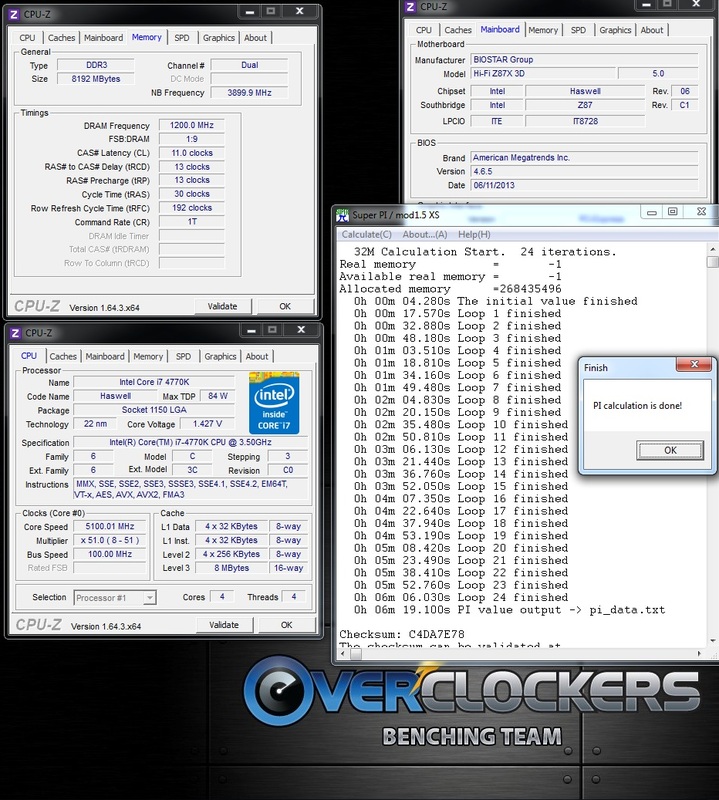 In this brief CPU section you have control over most anything you need, be it CPU ratio, BCLK, Power limits, HT on/off, Ring ratio, C states, and turbo to name a few. In most BIOS we see the CPU functionality separated from the overclocking, but I like to see the two combined for easier changes. 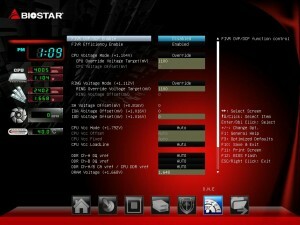 In the voltage section, we see a ‘Haswell typical’ set of options here. CPU voltage, Ring voltage, SA voltage, CPU Vcc, IOAnalog, IODigital voltages, and last but not least, DRAM voltage. There are also some more detailed voltages for the memory that one may use as well. 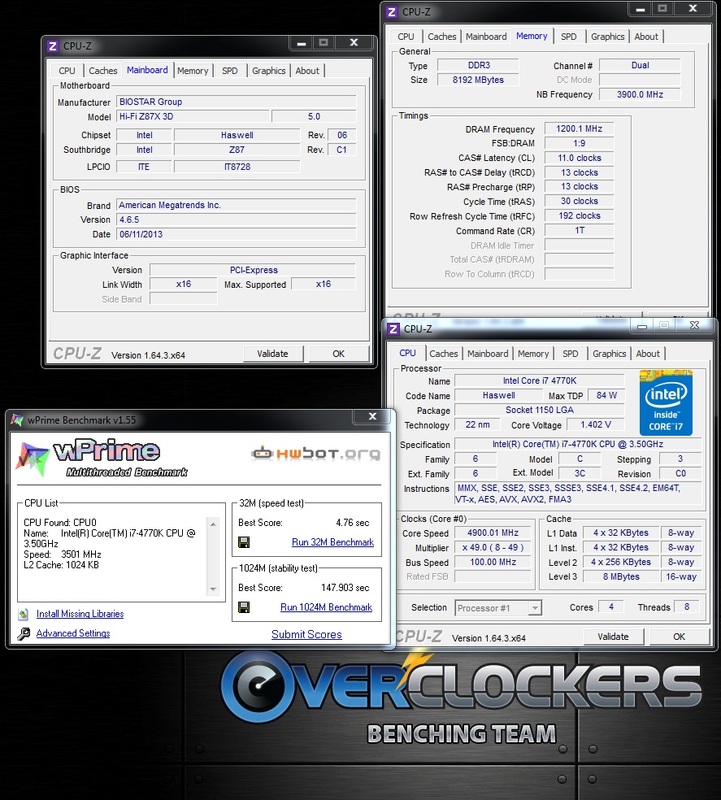 Basically all you need to get a very solid overclock on this board. The last two thumbnails are just of the bottom of the voltage section showing the DRAM voltage, and the last is the DRAM timings page. As you can see there are plenty of primary, secondary, and ‘other’ timings to adjust. Should make even the most extreme memory tweaker crack a smile on his/her face. 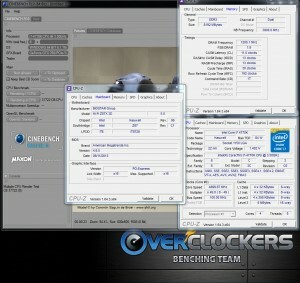 The first bit of software we are going to look at is BIOSTAR’s TOverclocker. 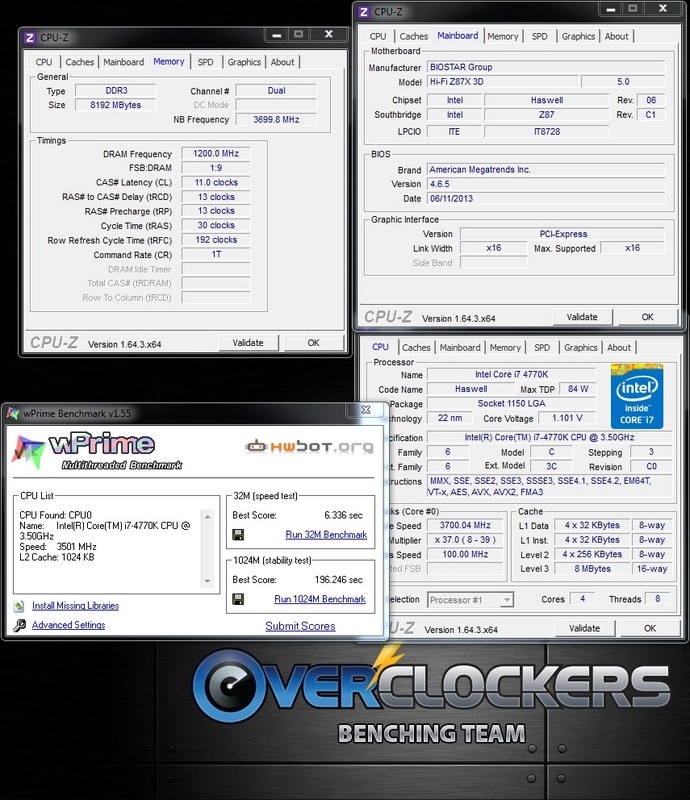 This software should be able to monitor and overclock your system from within Windows. 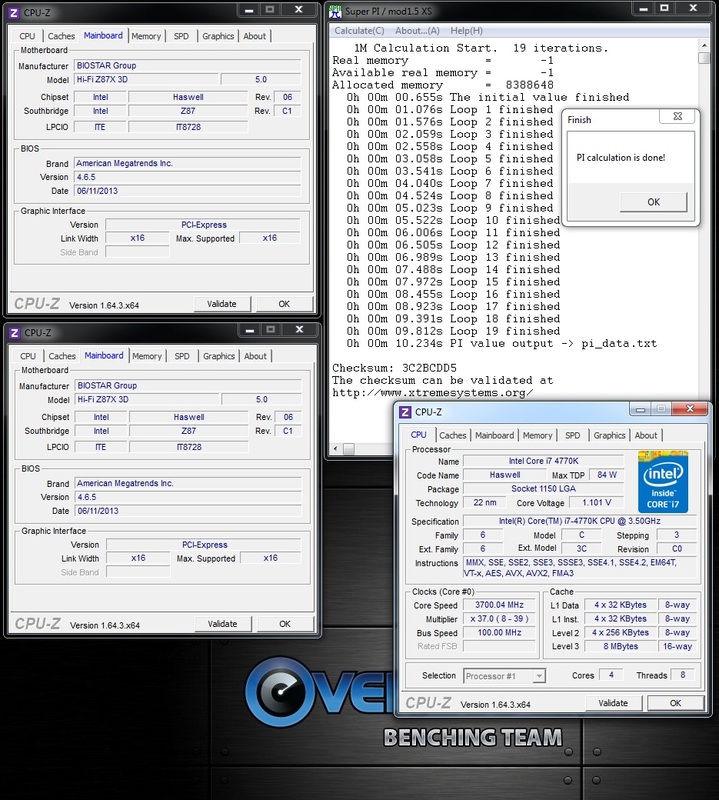 The first ‘tab’ we see is the CPU section. Here we can see some high-level information about the CPU and its clocks, and the motherboard you are using. 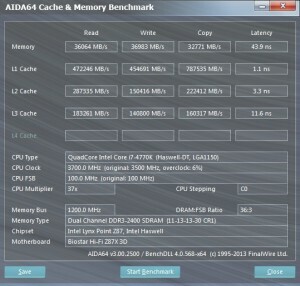 In the memory section, it is just that, shows you high-level information about the memory in the selected slot such as brand, speed, timings, and voltage. Next up is what most on this site want to see, the O/C Tweaker section. 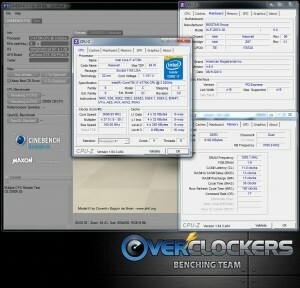 In this area is where you would actually do the overclocking. 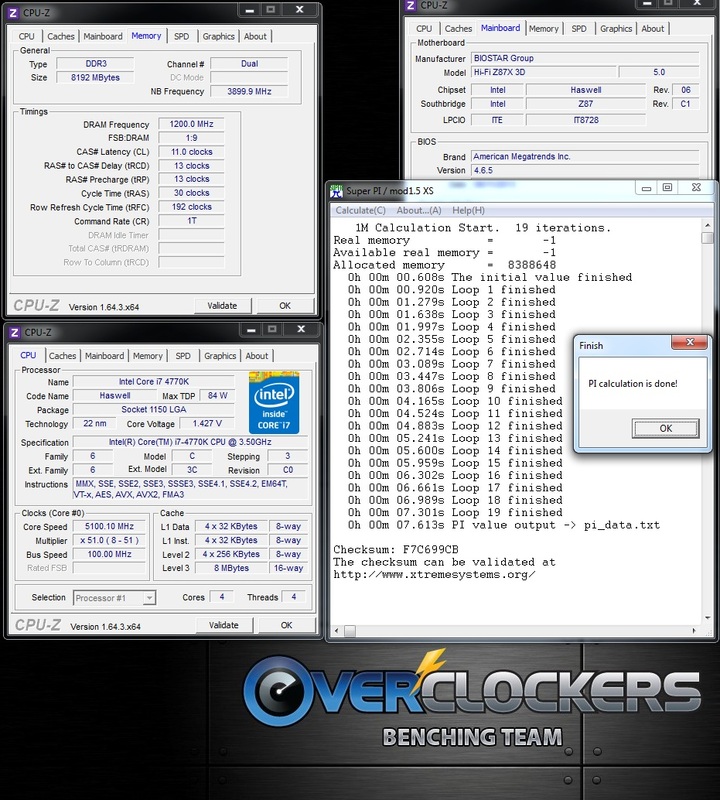 In the OCTweaker section there are two sub tabs, the first is for frequency, which contains items like Power limits, core ratio, BCLK, and even an adjustment for the iGPU’s ratio. In the second section, voltage, is where you can change voltages such as, CPU VccIN, DRAM, PCH and PCH PLL, and Vcore… again, all one really needs to make needed adjustments from within windows. I had no problem using this software. It looks just fine and does its job without a hiccup! 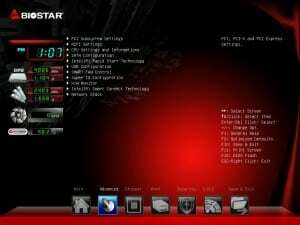 The next Windows-based software I would like to share out of BIOSTAR’s ‘suite’ is the Smart Speed LAN. Like other implementations that use a Killer NIC and its software, BIOSTAR doesn’t use the cost adding NIC but just uses software to help prioritize traffic. So for the pushing the limits section, we always like to see just what this system can do. 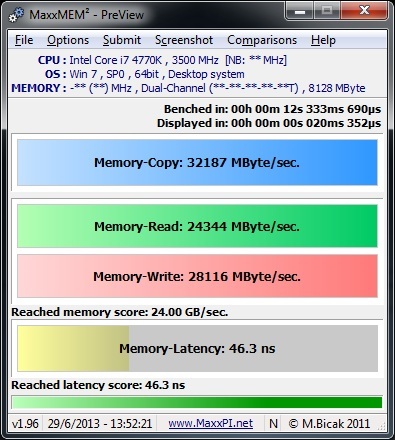 On this system, using the same CPU, I pushed it up to 5.1GHz and was able to run Super Pi 1M/32M against it. 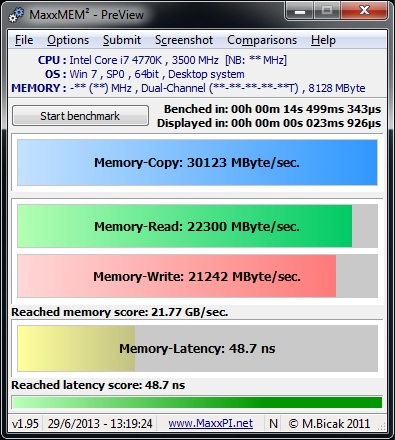 The temperatures just would not allow me to clear WPrime 32M or 1024M with this voltage and would throttle the CPU because of it. 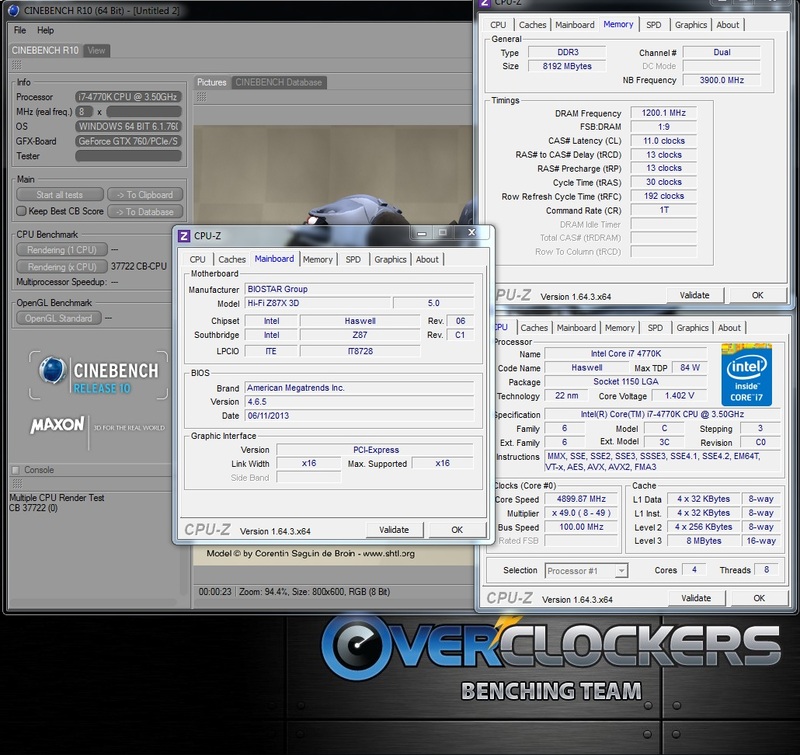 Still for a mid-range board that was not specifically made for overclocking, this is a pretty solid result. 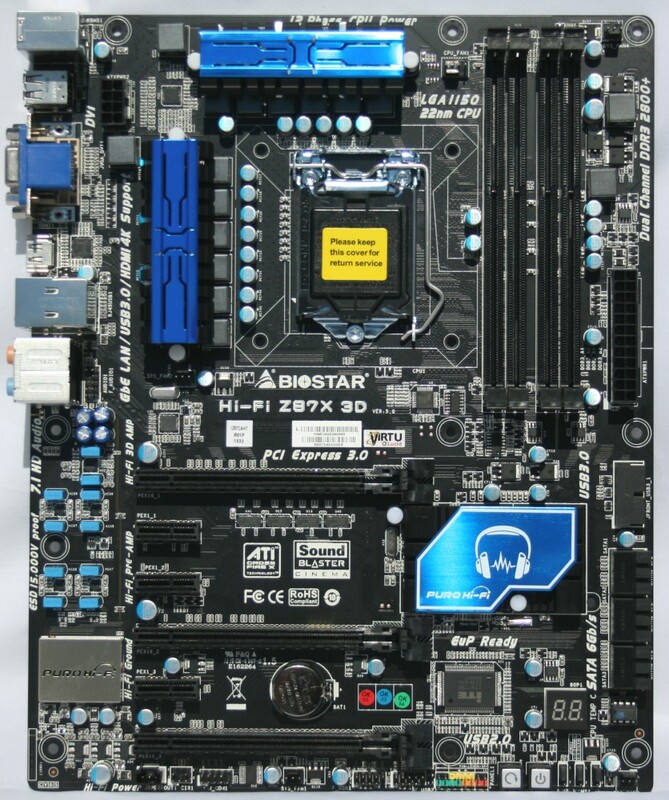 So where do we stand on this motherboard after taking a look at it? Overall I am left with a very positive impression. 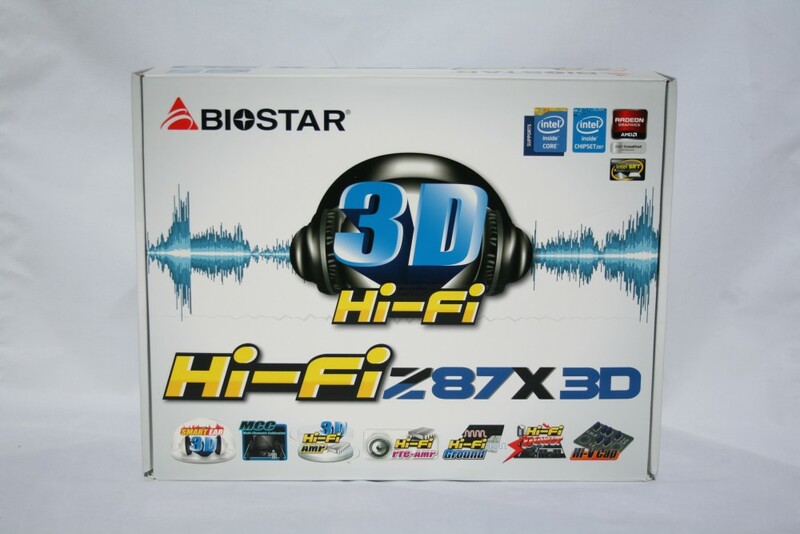 BIOSTAR has chosen to focus a lot on audio with this board, the Hi-Fi Z87X 3D. 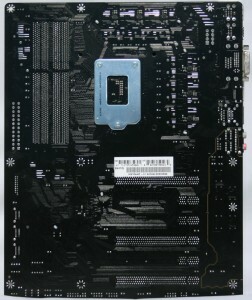 They covered the Realtek chip to prevent EMI, separated the audio section from the rest of the board, use different and purportedly better hardware in the Hi-V caps to boot. Sadly, I do not have the equipment to test it, but I can say subjectively it sounded good with my cheap cans even. Outside of the audio, this board has a robust power delivery section to support some significant overclocking. That, with its windows based software for both, help to make this a well-rounded board. I can’t say I have too many complaints really… perhaps one would be to have both CrossfireX AND SLI support instead of just the former. While multi-GPU users do not make up a huge part of even enthusiasts, you may lose a bit of potential buyers with only supporting one and not the other. 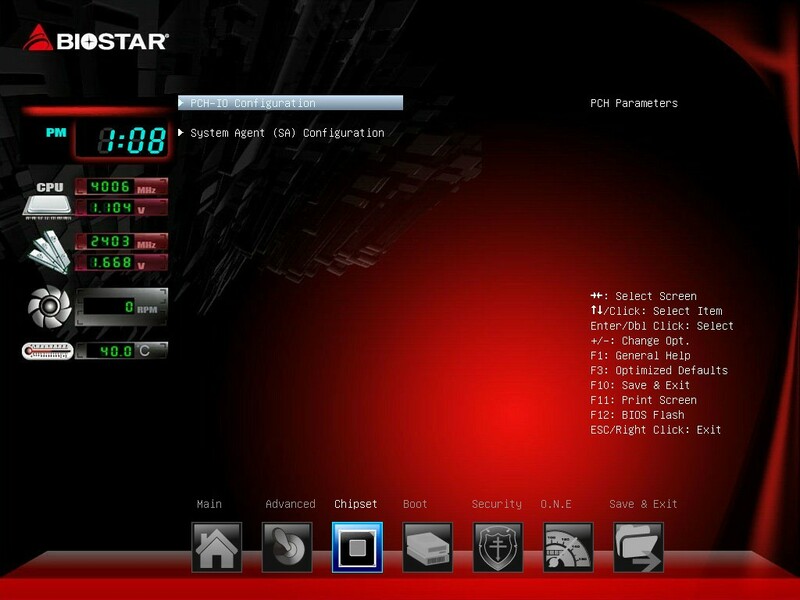 Another thing I can think of is the UEFI BIOS look and lack of mouse support (on my system). It’s just not my favorite aesthetically and would have loved to use a mouse since most (all?) others seem to have that ability. That said, it is simple and works well without the mouse and striking good looks, and really that is what matters. The last item is not having an optical out for the audio. If you go to so many lengths to improve the audio section, why not get an optical out on the back I/O area? Pricing on this board is $149.99 at newegg.com. 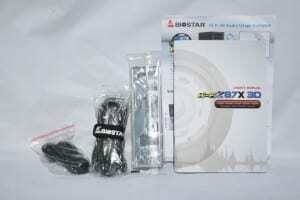 At that price point, you are competing with the likes of the Gigabyte Z87X D3H, and the ASUS Z87-A. Both formidable boards in the price range. I haven’t had either board in my hands, but as linked above, we reviewed the ASUS. That said, it’s still tough to compare. But from what I have seen, this board should certainly be a worth a feature comparison look around that price range, especially if you are looking for a good onboard audio solution. 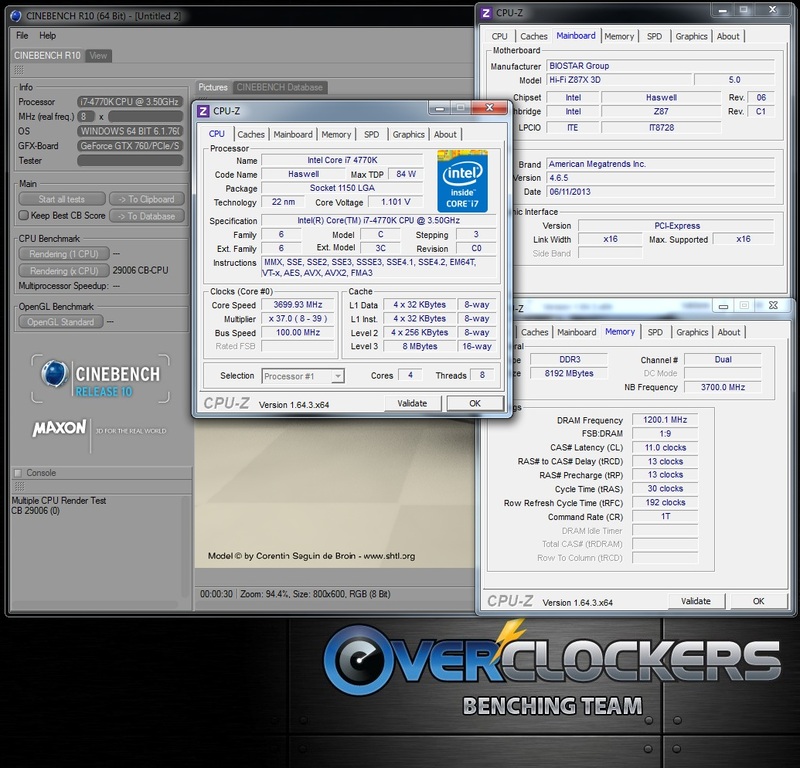 This board is Overclockers.com Approved!